Today’s #MusicMonday is an electronic beat that has been on repeat on my iTunes this week and comes to you off of 22Âº of Beatitude, an album that drops tomorrow on March 1st. 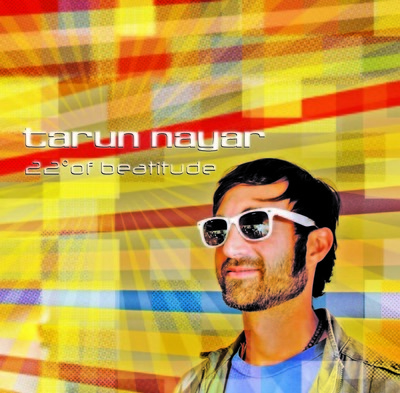 The album is Tarun Nayar’s first solo effort and is a compilation of music spanning a decade of sounds collected worldwide. Tarun has been a music maker for years, having traveled the world in the Canadian fusion troupe Delhi 2 Dublin as well as been a part of the music site Chaiwalla’s BOOMBox. Breaking out of the dancefloor-driven format, Tarun’s aim was to record as many of the sounds as possible, live, without the use of sample libraries. Each of these songs tells a story, and each story is a chapter in the artist’s life. The album itself is an eclectic electro mix fusing together the classic Indo-influences with a range of drum n bass, trip hop, and chill beats. A lot of the sounds are reflective of the Karsh Kale, Bally Sagoo, Talvin Singh era of sound from this past decade. But the song that I can’t get out of my head diverges from the rest of the album with a surprising B-more funk that feels like it was dropped in the middle of hot day in Rajasthan. I’m not really big on Bollywood/Bombay-ish/Filmi music, though I have a vague appreciation for the historical importance and the beats do fill me with that Desh pull. But that just may change with a new site just up on the interwebs and recently handed to me, thanks to an awesome find by GirishRaj. It was so delightfully mishthi, I just had to share on The Mutiny immediately. A beautifully designed site, Bombay Production is the Desi version of Pandora, on really spicy achar. With visuals reminiscent of classic Bollywood posters, an easy to surf matrix layout and the ability to easily listen through songs throughout the eras, this site is sure to be a hit amongst all of you amateur Bollywood ethnomusicologist. For over seven decades films have been the primary entertainment source in India, introducing us to great music through highly creative and talented singers, songwriters and composers. Our inspiration comes from this rich history and we hope to capture some of it’s magic to bring you an experience that is different and engaging. The World Cup final is to be played on April 2 in Mumbai, whose Wankhede Stadium has a capacity of 33,000 seats. Of these, only 4,000 have been allocated for sale to the public. The remaining tickets, a whopping 27,000, are reserved for the ICC and the Mumbai Cricket Club’s associate members (ESPNCricInfo). Not only that, but when fans tried to buy tickets online, the whole system crashed from the number of people trying to make purchases. The most prominent errors took place on Monday afternoon when the servers of Kyazoonga.com, the ICC’s official ticketing partners, were overwhelmed with the load as the site went ‘live’ with sales for the final and semi-finals at 1pm India time. The website received close to ten million hits in a matter of minutes – half a million at any given moment – many of those people refreshing the site. It would have needed, a Kyazoonga staffer said, a server farm the “size of a football field” to keep up with that kind of demand. The site crashed by 1.05pm and the few people who had got into the system and begun purchasing their tickets found their plans hanging somewhere in cyberspace. The website went online again around 9.30pm IST with a statement that no tickets for the finals & semi-finals had been sold on Monday due to the system issues and that updates about the ticket sales would follow. So, all the tickets allocated for online sales will still be available once the Kyazoonga network teams in India, Europe and the United States get their servers up and running again. Kyazoonga were not willing to reveal an approximate time when that was expected to happen. Epic Fail. Oh well, it’s better on TV anyway, right? Even if you’ve traveled from South Africa to see it live? Um, yeah. This weekend should be more promising: On Saturday, Pakistan and Sri Lanka play in Colombo, and England takes on India in Bangalore. And in case you’re still not sure what this game is all about, have a whack here. Stick out the first half-minute. You’ll be glad you did. Today South Asian Americans Leading Together is launching a year long narrative campaign ‘America4All.’ The campaign will be collecting and sharing stories from the South Asian community on reflections of the past ten years since September 11th. Cross posted below is my piece launching the campaign on the SAALT Spot blog. Please follow the blog to get the latest from the ‘America4All’ series. I used to tell this story. It was 2001 and I was living in D.C., 22 yrs old and miles away from my family in Los Angeles. It was just months after September 11th and as a Muslim South Asian woman, though I knew there would be repercussion for looking like the enemy, I was most worried about my family. Thus marked my oft told founding story of why I became a South Asian American activist. Ten years since September 11th, 2001, I wonder, how much has really changed? This is the story I tell when people ask me about South Asian American Voting Youth, an organization I founded in 2003 to organize young South Asian people around the country. I was young, naÃ¯ve and invincible. I truly believed in the power of electoral politics and civic engagement and, most importantly, I believed we could swing political power in our favor when we vote. If we did that – the racial profiling, hate crimes and marginalization of our community would all just stop. For #MusicMonday today I bring to you the Headless Horseman, an “adventure girl pop duo” coming at you from Brooklyn, New York. Though the band has only been around for the past six months, they have already been making quite the splash. 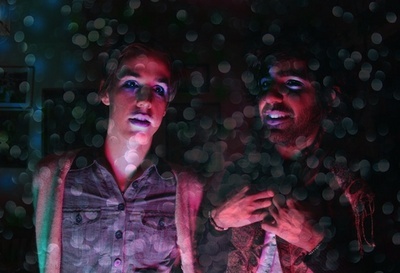 Headless Horseman will be part of the Brownout with MTV Desi this Friday, sharing the stage with Shilpa Ray and Her Happy Hookers and a bunch of other bands we’ve covered here on our site. If you are in NYC, I totally suggest you check it out. Exclusive to Sepia Mutiny readers, you can download for FREE the track SH8KR RIGHT HERE 04 SH8KR.mp3 . I also asked Fareed Sajan a few question about his music, his life, his sound. Here is what he had to say. Taz: How do you feel about your Brownout show this Friday with MTV Desi and sharing the stage with dynamite Desis like Shilpa Ray and Her Happy Hookers, PO PO and Sunny Ali and the Kid? Fareed: Really glad to have MTV Desi on board, of course like any ‘alternative’ listening teenager I paid attention to MTV in 90′s. Cool to partner up with them to do something different, and something that feels culturally relevant, at least for me. The bands featured are certainly relevant. Growing up going to the mosque, and mosque related social events, I used to fantasize what it would be like to perform at any social function for my fellow brown people. Like instead of Dandiya and a band playing Dandiya music, I’d imagine performing “Untitled 8″ by Sigur Ros off the ( ) album, and I would wonder how people would react to something so ethereal and blissful and alien. Maybe this is the closest I will get? T: What did you do to get Heems of Das Racist to take you under his wings and manage you? Hamad and Farid, the two guys who created the Indian version of “Teach me how to Dougie“, are back with a new viral hit. This time they’ve mashed up the video for Chaiya Chaiya with Willow Smith’s ubiquitous single “Whip My Hair.” Enjoy! They should hold an essay or short story contest for NYTimes readers that continues this story. Or, our readers can in the comments. Some of you might remember Sepia Mutiny’s coverage of the only Cricket World Cup to occur during this blog’s existence (2007 in the West Indies). Here we are four years later (can you believe it!?) and this time the World Cup is being played in Bangladesh, India, and Sri Lanka. What? You don’t speak German? Oh. Well unfortunately, I can’t find a nice, concise video presentation in English of how cricket is played. Any suggestions? If you’re the texty sort, here are the laws of cricket, with a few slightly helpful pictures. If you’d like to translate those to video, I actually suggest watching Lagaan. I know what you’re thinking, but don’t worry. You can skip all the parts about drought, taxes, Radha, Krishna, betrayal, rhyming “kiss” with “bliss,” and skip straight to the actual match. Why? Because if I’m not mistaken, the match in Lagaan has a demonstration of every single way you can get out or score a run in cricket. If you’re in the US, your viewing options are fairly limited, not least because the matches start at either 11 pm or 4 am eastern time. If you’re a DirecTV subscriber, you can buy the World Cup bundle for $149. You can also pay for an online streaming subscription through willow.tv for $129. Willow offers replays and highlights of previously played matches. The tournament is also available through Dish network, though I’m not sure for how much. The World Cup final will be played in Mumbai on April 2. Is Mandvi the new Cosby? As a Desi child of the 80s, television in our household growing up included news with Peter Jennings, PBS shows and The Cosby Show. Think about it – as an immigrant Bangladeshi family during the First Wave (post-1965), my parents (and their community) were drawn to shows like NOVA and Jacques Cousteau to teach them about the sciences. They counted on Peter Jennings to get the news. It was their connection to assimilating and learning about their place in the world. And The Cosby Show, well the Cosby family showed us how to be the proper brown American. It was a halal show with none of that kissing-shmissing thing that you’d see on the other television shows, except of course what happened between Cliff and Claire, and in our house my parents would have the remote in hand to change the channel as soon as kissing came on the screen. Seriously. This was how I learned to be an American – affection-less and model minority-ed (kidding, kind of). Maybe, as Katie Couric suggested, all the Muslim community needs is a sitcom showing the quintessential model minority Muslim family. Just like The Cosby Show. Maybe the The Qu’osby Show. Aasif Mandvi takes a stab at creating a pilot episode and it’s blowing up the air waves on The Daily Show.